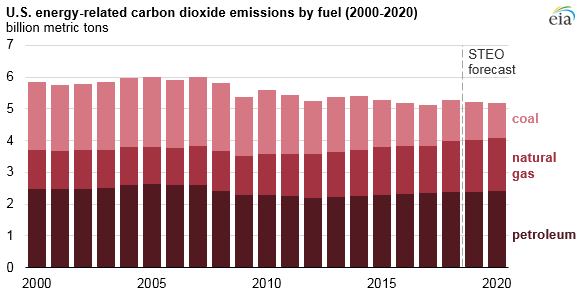 According to EIA’s recently released Short-Term Energy Outlook (STEO) estimates, energy-related carbon dioxide (CO2) emissions increased by 2.8% in 2018 but will decrease in 2019 and 2020. The 2018 increase is the largest in energy-related CO2 emissions since 2010. Although emissions from petroleum—primarily used in the transportation sector—account for the largest share of total energy-related CO2, emissions from natural gas, which increased by nearly 10%, drove the overall increase in 2018. Weather conditions and continued economic growth were the primary factors in increasing energy consumption and emissions in 2018. Based on preliminary data, total U.S. energy consumption in 2018 will be just 0.4% below the record set in 2007. 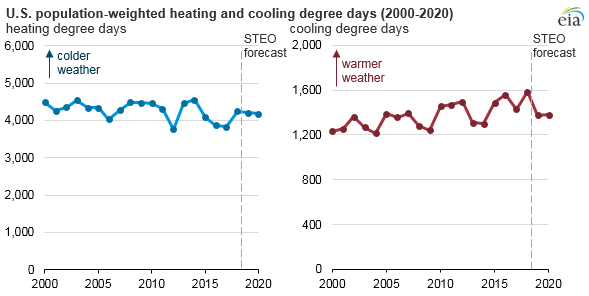 Relatively high energy consumption is attributable largely to changes in the weather: last year was very warm, and U.S. population-weighted cooling degree days (CDD, an indicator of air-conditioning demand) hit a new record in 2018.